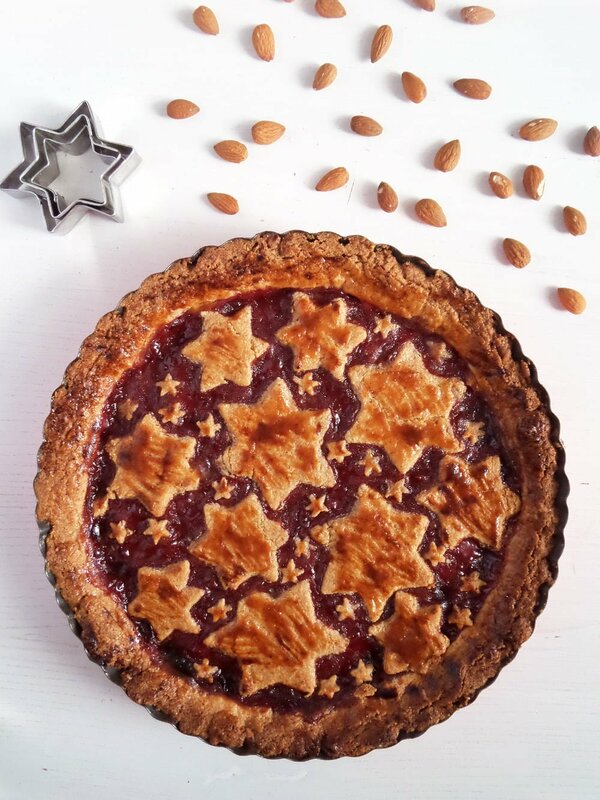 This is my variation of the famous Austrian Linzer Torte, a simple but unbelievably tasty cake made with shortcrust pastry covered with generous amounts of redcurrant jam and topped with a lattice of the same shortcrust pastry. Really, what can be simpler? Yet the taste is rich due to the almond pastry, sweet while still refreshing thanks to the sweet-sourly redcurrant jam. I have always liked the Linzer cookies and have been making them every Christmas for years now, but it must be only the second or third time that I make the cake itself. I wanted to bake a cake a few weeks ago and while searching for something in the cellar, I’ve noticed that I still have 3 large jars of redcurrant jam made 2 years ago. I immediately thought of making the cookies, but then thought that October is definitely too early to start making cookies. So I settled to make the Linzer torte instead and this was the result. I hope you like it! Instead of the usual lattice on top of the cake, I went for the stars. I found it prettier and the children were able to help making the cake this way. Plus, I thought about blogging and how a star cake would be suitable for a blog post sometimes before Christmas. (I always seem to think about that nowadays, it is amazing how much mental and physical energy this blog costs me – but I like it, so this is not really a complaint). But if you like to make the traditional lattice instead, please do, it will not change anything but the look of the cake. 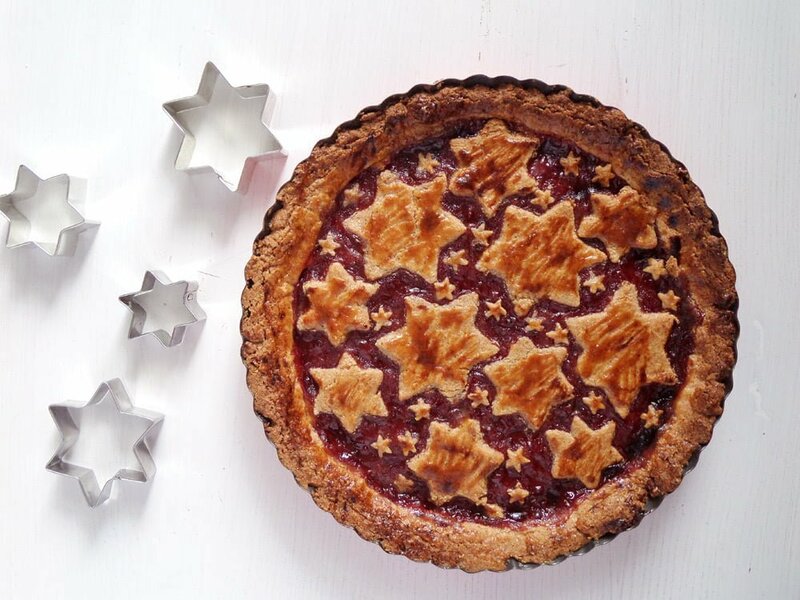 There will be some pastry leftover in the end, I used that to make more stars and bake them as well. We ate those as biscuits over the next few days. If you don’t feel like making biscuits, you can freeze the extra pastry and use it later for making cookies. Place the flour, almonds, sugar, cocoa powder and cinnamon in the food processor and process shortly to mix everything together. Cut the cold butter into small pieces, add them to the flour mixture together with the egg yolks and the tablespoon of water and process until you obtain rough crumbs. Turn this mixture onto the working surface and knead very very shortly until you obtain a smooth dough. Cover the pastry in plastic foil and place in the fridge for about 30 minutes. Butter and flour a 26 cm/ 10 inch pie form (preferably one with a detachable bottom, it makes things easier in the end). Shake to remove the excess flour. Place the form in the refrigerator. Roll ⅔ of the pastry between two sheets of baking paper. The pastry should be rolled about 1 cm/0.4 inch thick and a bit larger than the pie form. Remove the baking paper on top of the pastry and use the lower piece to turn the cake into the pie form. Remove the second piece of baking paper as well. Press the pastry into the form and remove the excess pastry hanging over the edges of the form. Roll the rest of the pastry about 5 mm/0.2 inch thick and either cut out stripes to form the lattice or cut out shapes using star cookie cutters of different sizes (or heart/flowers/teddies cutters, whatever). Stir the redcurrant jam very well and distribute it evenly on top of the pastry. Arrange the lattice or the stars on top. 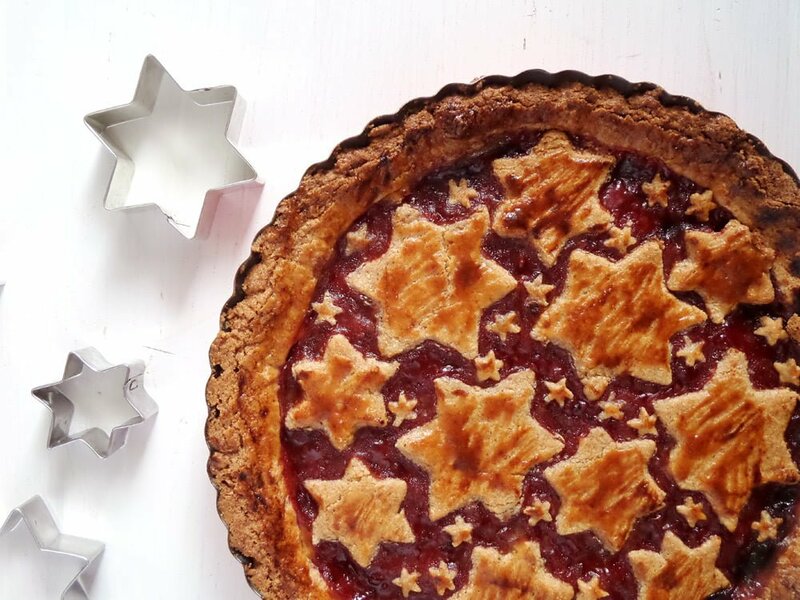 Mix the extra egg yolk and the milk and use this mixture to brush the stars/lattice and the edges of the pie. Bake the cake for about 40 minutes until the lattice/stars are golden brown. If you want to bake the extra cookies as well, bake them for about 10-15 minutes or until golden brown. Thank you, Brie. Well, in Germany you could buy it just about anywhere, but no idea where you could get it there. You could replace it with some other sourly berry jam or I imagine plum or cherry butter would be suitable as well. As long as they are not too sweet. Let me know if you baked it. This is beautiful and so… festive. I love your “star” variation. wow that crust looks so gorgeously golden brown and melt-in-mouth! The Torte looks awesome, Adina. Wow, this torte looks fantastic! What a creative and tasty treat. Just love how cute and fantastic this is. What a tasty pie! I made one with plum jam ( that was the only one I had at home), I couldn’t help getting piece after piece until nothing was left. The egg whites I used today for your hazelnut macaroons. I love your blog and I will definitely try more of your recipes! Hello Marina, thank you for your nice words, I am very happy that you liked the pie! I hope you will like the macaroons as well, it is great to be able to use all leftovers, isn’t it? I hate it to throw away food and I always try to find ways to use up everything. Happy New Year!